When a skin rash appears, it means itchy, red skin until the rash finally clears up. A severe skin rash can even be painful, especially if it is scratched too much. While dealing with a skin rash is always irritating and frustrating, knowing about the causes and treatments can help to manage a severe itchy rash. A rash is not a diagnosis on its own; rather, a rash is a symptom of something else that has caused irritation to the skin. 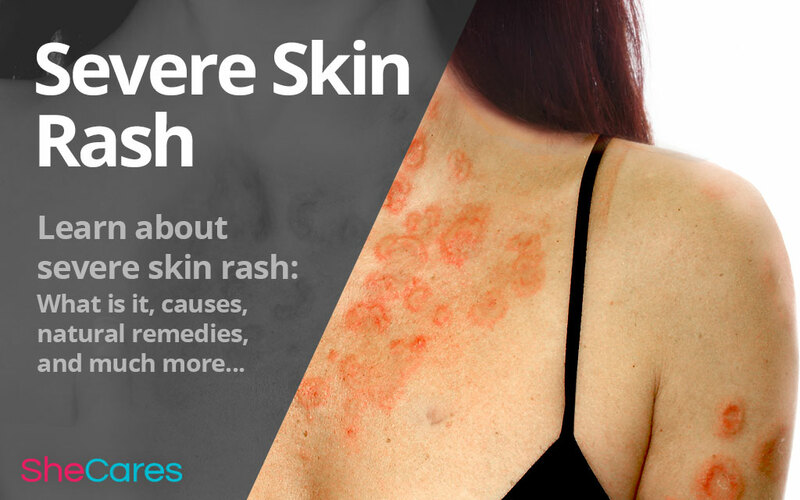 While rashes are nearly always either itchy or painful, a rash can describe anything that changes the appearance of the skin - something that makes it swollen, red, or otherwise different from normal. A severe rash is one that causes extreme discomfort, enough to interfere with daily activities and responsibilities, or one that lasts several days to weeks without becoming milder. Bug bites. A number of insects and other bugs have bites that will irritate human skin. Mosquitos and spiders are some of the most common, but bugs like bedbugs are also fairly common, and bedbug bites tend to look more like a rash than mosquito bites. Allergies. One major symptom of an allergic reaction is a rash, or hives. While many people are aware of their allergies, it is possible to develop an allergy to something new, so this cause should not be discounted as a possibility, especially if other allergic symptoms - such as difficulty breathing - are present. Contact dermatitis. When the skin comes into contact with something that causes irritation, but that is not an allergen, it is called contact dermatitis. Poison ivy is one example of a substance that causes a contact dermatitis rash in many people, but many other things may cause this as well, such as soaps, detergents, or even jewelry. Eczema. Skin conditions like eczema - along with psoriasis and others - are characterized by itchy, red patches of skin that appear like rashes. Infections. The skin may also become infected. These infections can be caused by bacterial, fungal, or viral agents. Athlete's foot is a well-known example of a fungal skin infection that can cause significant discomfort. Underlying illness. Some illnesses, like anemia or thyroid problems, can cause a skin rash to appear. Ice packs. Anything cold and damp - such as ice, icepacks, or cold compresses - can help to reduce the sensation of itching on a rash. Oatmeal. Famous as a chicken pox remedy, oatmeal baths can help soothe rashes as well, although oatmeal poultices are easier to make and will help as well. Lotions. As long as it is fragrance-free, lotion is likely to help repair the skin and keep it from itching as much. Menthol and calamine. These products both produce a cooling sensation on the skin, which works like ice but without needing to hold an ice pack to the rash. For any severe skin rash, it is important to see a doctor in order to determine the underlying cause of the rash. Because of the severity of the problem, it is necessary to rule out more dangerous and potentially life-threatening conditions before starting on a treatment plan. Learn more about home remedies for skin rashes.